The intention of war is to kill, to maim and to destroy using, for example, the agency of 18-pounder artillery shells (so-called because they weighed 18 pounds). The shells were loaded in to the 18-pounder field guns used by the Royal Artillery and targeted to destroy German batteries and trenches as well as to shoot down aeroplanes. In Under Fire, Henri Barbusse recounts how the incessant and diabolical din of war constantly bombarded the soldier body with the unendurable noise of bursting shells that caused pain to the ears (Barbusse 2010 : 207). The noise was so ‘monstrously resounding’ that one felt ‘annihilated by the mere sound of the downpour of thunder’ (Barbusse 2010 : 206). Artillery shells were designed to be recycled and spent shells were returned to the munitions factory for re-filling, a mark engraved upon the head-stamp at each re-filling. Millions upon millions of shells were recycled and re-fired. A mound of spent shell cases, Nord, Nord-pas-de-Calais, France. Taken by war photographer, Tom Aitken, 1918. Available via the National Library of Scotland as CC BY-NC-SA. People’s experience of the First World War did not end with the armistice. Whilst the noise of the artillery had ceased, the noise of war was remembered. Harry Patch on arriving home injured recalled being ‘jumpy for a while’ with the least noise prompting him to dive for cover (2009: 114). Something else materialised. Relationships with ‘objects’ were forged as recycled objects of conflict were welcomed into people’s homes. Such objects were embodied with personal experiences of war, later to become objects textured with memory, remembrance, and longing – attributes that clearly go beyond an object’s form and function. Take a look at this pair of spent 18-pounder decorated artillery shell vases, an example of war-related materiality known as ‘Trench Art’, a man-made recycled reality of the industrialised war of materiel (Saunders 2003). 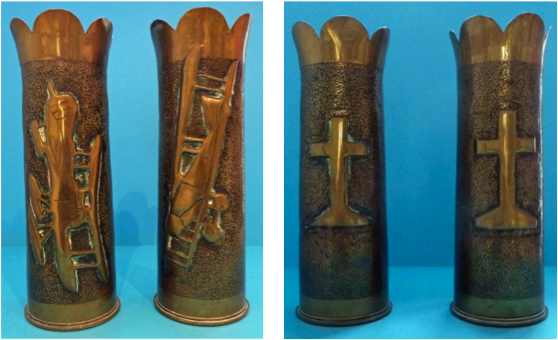 This pair of vases depicts two different bi-planes, each vase with a memorial cross pressed on the verso, both planes and crosses being objects witnessed daily on the Western Front. 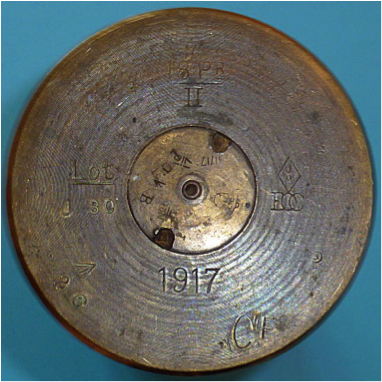 The head-stamp of these particular shells displays the British broad arrow and the initials ‘EOC’ indicates that they were made at the Elswick Ordnance Company, England; the initials ‘CF’ signal that the charge was loaded with cordite, a standard propellant. Head-stamp of one of the trench-art decorative shell vases. Photograph: Melanie Winterton (CC BY-NC-SA). Spent shells were illicitly scavenged from massive mounds by both soldiers and civilians alike to become personal souvenirs or to swap or sell on. First World War pilot, Arthur Gould Lee, crash-landed his plane adjacent to a British artillery battery. He took some souvenirs back ‘for the chaps’ in the form of ‘Boche’ rifles, spent artillery shells and grenades (1969: 256). Spent artillery shells were crafted, often using a hammer and a bent nail. The crafting of trench art reflects the construction of an identity that offers momentary relief from the hells experienced in the trenches. Through concentrating on making the vase, for a moment in time, in his contested space, the maker can think of something else other than the horrific realities of trench or aerial warfare – for a moment in time, he is in control of what he experiences. The finished result was often sent to a relative as a souvenir from the Western Front. However, the souvenir represented much more than something to be aesthetically appreciated for it was embodied with experiences of being on the Western Front. On receiving these vases into my home, a smell of metal polish invaded the room in which I placed them, indicating, perhaps, that they may have been polished periodically, almost ritually, by someone. Perhaps the act of polishing prompted the polisher to remember a lost loved one as he or she touched the surface that their loved one had touched before them. The act of polishing represented a silent and emotional temporal communication linking the present with the past. Today’s generations in France and Belgium experience the effects of unexploded ordnance as farmers unearth the deadly ‘Iron Harvest’ which continues to kill people today. In the decades following the Great War, some trench art became consigned to an attic as people, perhaps, no longer needed to remember. As the owners died, such trench art became objects of collector appeal as they were sold, for example, at military fairs, car boot sales, or on eBay. Thus, an object has a life and its social circulation provides for an archaeology of association as the recent past of the First World War becomes inextricably linked to our present. It is hitherto apparent that people have relationships with objects and such relationships change over time as the meaning, significance and value of an object becomes far removed from its original purpose of production. Through recycling and re-circulation, objects of conflict undoubtedly created our social world for it is individual human agency that apportions meaning to our material world for ‘objects make us, as part of the very same process by which we make them’ (Miller 2010: 54). Barbusse, H. (2010)  Under Fire (Radford: Wilder Publications). Gould Lee, A. (1969) No Parachute. The Exploits of a Fighter Pilot in the First World War (London: Arrow Books Ltd). Miller, D. (2010) Stuff (Cambridge: Polity Press). Patch, H. (2009) The Last Fighting Tommy. The Life of Harry Patch, Last Veteran of the Trenches, 1898–2009 (London: Bloomsbury). Saunders, N.J. (2003) Trench Art. Materialities and Memories of War (Oxford and New York: Berg). I am an historical archaeologist and my area of speciality is Modern Conflict Archaeology, a young discipline that is primarily an anthropological archaeology (in a broad material culture sense) that encompasses the 20th and 21st centuries. It is multi-disciplinary in outlook and my research draws on archaeology, anthropology, philosophy and history. My AHRC-funded doctoral research focuses on a cultural study of the experiences of Royal Flying Corps pilots, whether on the ground, inside the plane, or flying during training, reconnaissance or combat. I explore the potential for a sensory archaeology, thus acknowledging the increasing popularity of this nuanced focus on the materiality of human existence. Modern conflict archaeology and contemporary archaeology more widely need to consider ‘airspace’ as a distinct realm. Consequently, I am interested in the pilot body’s sensory experiences of ‘airscapes’ and the need to bring to life tangible aviation-related material culture. I also address heritage issues, especially in terms of how we remember and experience First World War aviation. 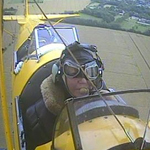 I adopt participatory anthropology – I fly in early twentieth century planes – as a means of embodying the experience of being in the air, thus adding a dimension of authenticity and empathy to my research. I am a contributor to: Saunders, N.J. (ed.) (In Press) Beyond the Dead Horizon. Studies in Modern Conflict Archaeology (Oxbow). This entry was posted in Machine, Material Culture and tagged 355 (Military science), 700 (Arts), 900 (History & geography), 940 (General history of Europe), Blogs, N (Fine Arts), NK (Decorative Arts), U (Military Science). Bookmark the permalink.